Update, March 3rd: Yuzuru has produced demo video for Idobata 2, and I’ve included it at the end of this article. 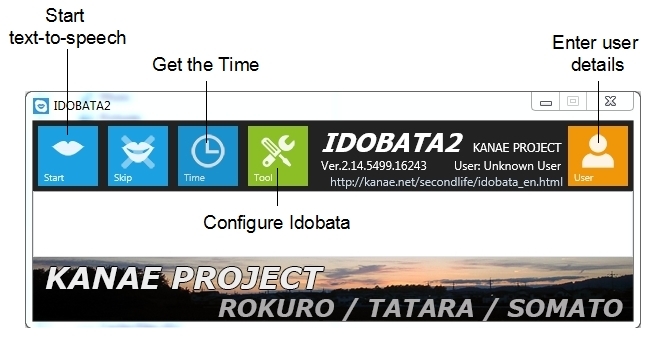 Update, January 28th: as noted below, Idobata 2 is now available from the Kanae Projects website. Over the last couple of years, I’ve been asked by Yuzuru Jewell to evaluate some of his software tools – a task I’m always delighted to perform as time allows, although in truth, I’ve fallen a little behind of late. This being the case, when Yuzuru first notified me that he was working on a new version of Idobata, his a text-to-speech conversion tool, I made a point to be ready to clear time to look at it when he was ready to allow me access. Idobata was first launched in September 2013, when I originally reviewed it. As noted above, it is a text-to-speech conversion tool which currently works with the official Second Life viewer and both the 32 and 64-bit versions of Firestorm (and as a result can be used with SL and OpenSim). When running, the original version – Idobata Pro – would capture text typed into chat in the viewer in real-time, or view the chat look, and convert it into the spoken word. The new version, Idobata 2, still does that, but in addition it can also monitor all IM and group chat sessions, etc., and convert them to the spoken word. Further, Yuzuru has also added a capability for it to be used with Skype chats. Idobata 2 is due to be launched on Tuesday, January 27th, so the following is intended to preview the new version, which will be available on the Kanae Projects website from approximately 13:00 SLT onwards on the 27th. Unlike its predecessor, Idobata 2 will be provided free-of-charge, but will include banner adverts for other products in the Kanae Project range. Those who prefer not to have ads in their software can remove the banners by obtaining a user name and password from Yuzuru for a nominal donation of L$300 towards his running costs. 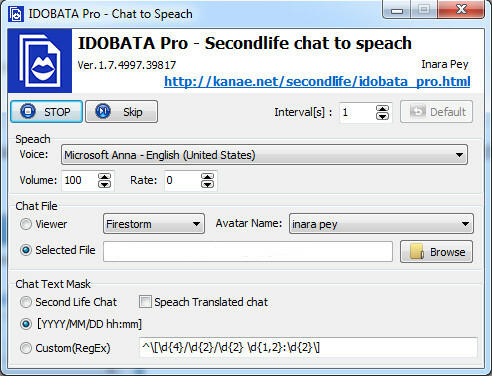 In order to use Idobata 2, you will need to download the ZIP file (when available) from Kanae Porjects (the application is provided in both 32- and 64-bit options), and you’ll also need to have the Microsoft Speech Platform 11 runtime, installed on your PC as well. If required, you can also download alternative / additional language and voice options for reading back text by downloading and installing the Microsoft Speech Platform Language Options. Once you’ve download the runtime platform and installed it, unzip Idobata to a folder of your choice and double-click on the program icon to launch it. Those who have used Idobata Pro will immediately notice the first difference between it and the new product: Idobata 2 has a much smaller, tidier UI. The main options for the application are displayed across the top of the window, together with an option to enter the users name and password to block the banner ads display at the bottom of the window. Between the options and banner area is a white space which will display the text currently being read back in voice – something that helps in situation where the spoken words many not be entirely clear (such as when abbreviations are being used, or technical terms, which may cause pronunciation problems for the application, etc.). Before using Idobata 2 with Second Life, some basic configuration is required through the Tools button. Clicking this will open the 3-tab configuration window. The Chat Text tab is used to set the application for use with Second Life. Use the Custom(RegEx) option to define regular expressions which will not be read back by Idobata 2. 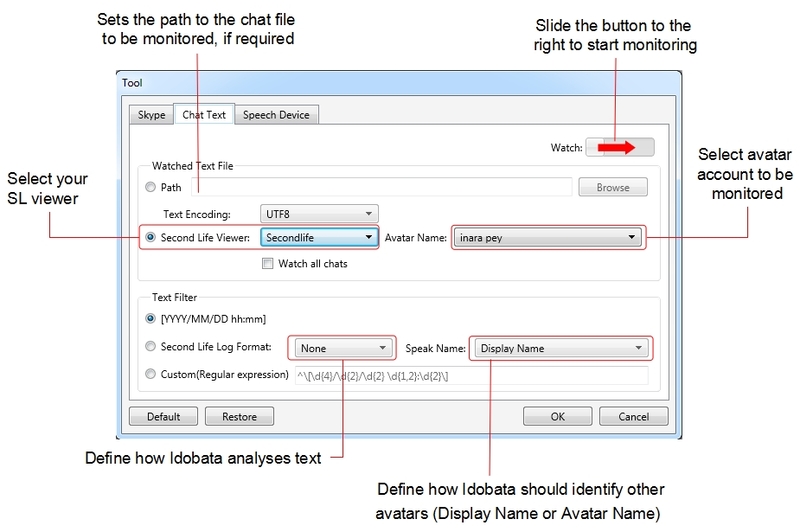 Once you have set your preferences, click OK to return to the main window, If you wish to reset Idobata 2 to its defaults at any time, click the Default button in the configuration window – note this will reset all options – both Skype (if set) as well as those for Second Life. In real life a tatara, or 鑪, is a traditional Japanese furnace for smelting iron and steel. In Second Life, Tatara, xreated ny Yuzuru Jewell under his Kanae Projects brand name, is a suite of tools which can be used to create sculpt maps and mesh collada files ready for upload to SL, and which includes both texture and bitmap editing capabilities as well. Tokoroten (“extruder”) – which allows shapes or parts of shapes to be stretched, twisted, etc. Mage – which can create more organic shapes and pipes and tubes, etc. A bitmap editor and a texture / drawing tool. Once a desired shape has been created, it can be saved / exported from Tatara as a sculpt map (.TGA format) or as a mesh .DAE file, each of which can be uploaded to Second Life, and file formats such as .OBJ and .XML are also supported. There are a number of sample shapes provided within the suite to help people get started, and files produced via other means can also be opened in Tatara and previewed / edited. 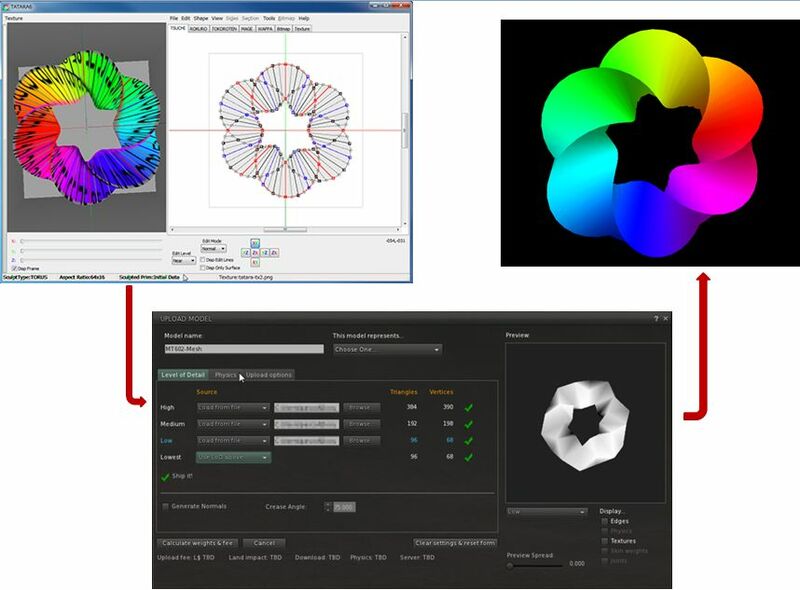 When loading files produced elsewhere, Tatara automatically disables any tools which cannot be used in editing the loaded shape (so you may find, for example, that loading a sculpt map will disable the Rokuro and Tokoroten tools). Stair plug-in which allows the creation of four different types of stair, each with a user-definable number of steps. Each of the four plug-ins also requires the purchase of a user licence to fully unlock them. 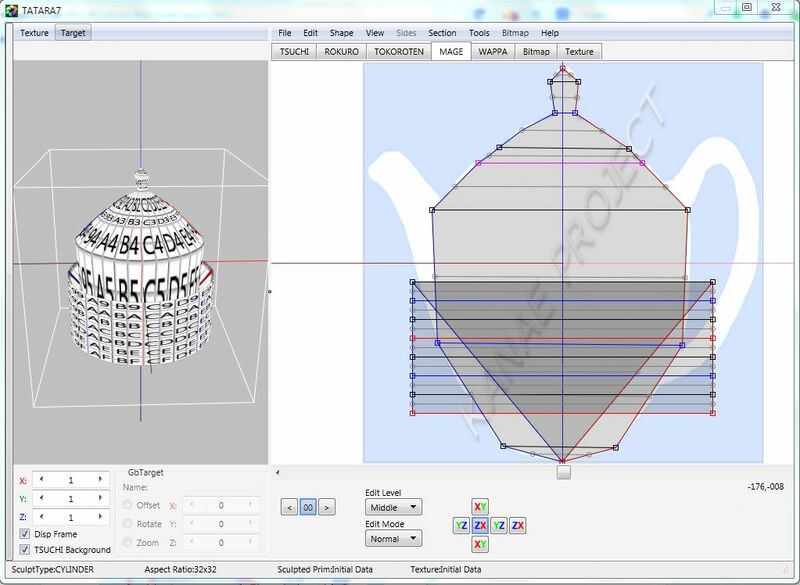 Tatara is available in three versions: Windows 32 and 64-bit versions and a Mac OSX version. There is no installer per se – the necessary files are provided in a ZIP file, which simply requires downloading and then unpacking to the desired folder. Once unpacked and launched, Tatara will start-up and display a prompt for your user name and password. If no licence has been purchased, clicking cancel will allow access to the application in the trail mode. The UI itself comprises two parts: on the left, a preview pane which displays a representation of your model, which can be drag-rotated in all three axes to examine the design; on the right a series of tabs accessing the various tool options, together with a set of menus and options – some of which may be tool-dependent. Getting to grips with Tatara is a little complex, but Yuzuru provides a solid user guide on the Tatara page of his website and a range of tutorials on his blog. Even so, it is fair to say the tools do require a good understanding of modelling and projection, and achieving a desired goal can take time if you’re not used to using creation / editing tools of this type. Nevertheless, the results can be very worthwhile, and for those wishing to add to their armoury of content-creation tools, whether looking to make sculpts or basic mesh, Tatara and Yuzuru’s other tools are well worth a look. Hanko (“seal”) – a tool which allows you to add your signature to a sculpt map. In the new release, version 4.2.0, Yuzuru has added the ability for Rokuru to additionally save generated maps as Collada file, allowing them to be uploaded into Second Life as mesh items (XML, OBJ (triangles and quadrangles) are also supported). Rokuro – meaning lathe – offers a simple and effective way of creating symmetrical shapes for use in Second Life, and the website provides a host of samples and templates with which to get started with the tool and which can be easily modified to suit your needs. 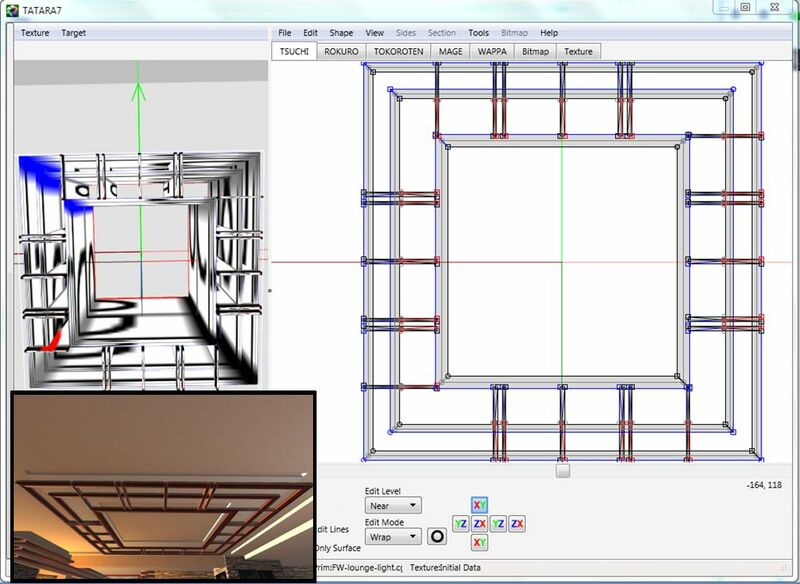 The UI itself comprises two parts – on the left, a “finished product” preview pane which displays a representation of your model, which can be drag-rotated in all three axes to examine the design, and an editing panel on the right, in which is displayed as a plan view of your shape, the right side of which can be edited (the left will automatically reflect all adjustments made). A range of menu-supplied options (including access to default shapes) and a range of settings provide a good degree of flexibility within the tool. Rokuro is offered free of charge (although donations towards its ongoing development and the development of Yuzuru’s other products are always welcome), and is available in Window 32- and 64-bit versions, and is also available for the Mac. For those wanting to explore the capabilities of the tool in more depth, there are a range of tutorials available both in-world and on the Marketplace. Note that some of these tools require the purchase of a serial number from Yuzuru’s in-world store, but time-limited versions are available for download through the Kanae Projects website in order to “try before buying”. With thanks to Yuzuru Jewell.